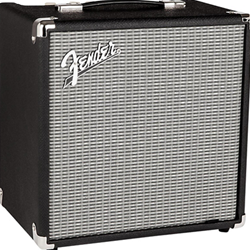 The new Fender RUMBLE 1x8" 25W bass combo is an ideal choice for practice or studio play, with its great tone, small size and easy-to-use controls. Besides the 1x8" Fender special design speaker, its features include an aux. input, headphone output, and three-band EQ. With its beefier power amp and larger, ported speaker enclosure, the RUMBLE 25 pumps greater volume and deeper bass response. In addition to standard volume and EQ controls, the RUMBLE 25 adds a newly-developed overdrive circuit and switchable Contour control, delivering gritty bite and slap-worthy punch at the mere push of a button.